Endlessly seeking that Elusive, Perfect Perfume? One that Uniquely Reflects you, Complements your Personality, and makes you feel more Beautiful and Desirable? Stop wasting time and money trying scents that smell good in the store – but don’t quite work when you get them home. Feel beautiful and romantic for hours, not just a few minutes with a gorgeous, long-lasting scent. Know you’ve chosen something truly yours and uniquely special – because people keep asking “What are you wearing?”. Stop collecting endless “not-quite-right” perfumes that are “OK” – but don’t reflect the unique you. Discover the 3 Key Secrets to Choosing The Right Scent for YOU - one that will complement your beauty and style, save you money, and avoid the frustration of collecting yet another “not-quite-right” perfume. How do you choose your perfect perfume? There’s a real challenge in buying a new perfume online. How do you choose the perfect perfume for you when you can’t actually smell it? Understand the 3 Notes That Make Up a Quality Designer Perfume. A fragrance takes a time to develop on your skin, cycling through 3 “notes” and combining with your pheromones. The end result is the marriage of the middle and bottom notes with your unique physiology. Know and Shop for Scents That Contain the Best Quality Ingredients. Choose the Essences of Your Dreams and Memories. You are what you love. The perfect fragrance for you – one that will complement your beauty and your style, even enhance your natural pheromones – is one that is one that is tied to the scents and the places that you love. It could be to a treasured memory, or it could be a place you’re drawn to and dream of. Fall in love with a Unique Fragrance that will transport you to the tropics… Perhaps you dream of the Caribbean – or fondly remember the beauty, warmth and luxury of an island cruise. 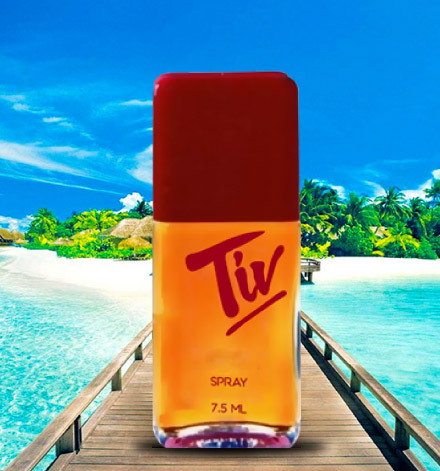 If you’re in love with the romance of the tropical Caribbean, then you will love Tiv – a unique, long-lasting, exotic and sophisticated perfume that will take you there every time you wear it. Tiv is the essence of the sultry beauty of the tropics, combining the scents of tropical gardens with the whisper of an ocean breeze, the dark heart of Africa and the mysterious aura of the Orient. Top Notes of Galbanum, Italian Bergamot and Ylang Ylang to sing out “tropic” at the first encounter. Middle notes of Italian Jasmine, Lily of the Valley, Bulgarian Rose and Cloves Bourbon to embody the heart of summer romance. Base notes of Amber, Vanilla, Musk, Myrrh and Olibanam to give an underlying beat of jungle vitality. When you use this romantic, exotic fragrance you will feel fantastic. And when you feel fantastic, you’re automatically attractive and desirable – which improves your self-esteem, your spirit and your relationships. Hello, I’m Tiv creator Cynthia Jerry. I’ve absolutely adored perfume since I was a kid and followed that passion through my fashion career. I fell in love with the romance and luxury of the tropics in the 1980s when I lived in the Caribbean after a successful career working for Essence Magazine as Director of Fashion and Beauty Marketing, and the Estee Lauder Company as Director of New Market Development in the Fragrance Division. I decided it was time to realize my dream and create a scent of my own – one that celebrated the spirit of the Caribbean. I worked with renowned perfumer and Coty Award winner James Bell to develop a unique “Designer Fragrance of the Caribbean”. Tiv was launched in 1982 and its timeless beauty has been loved by our many repeat customers over decades. The Timeless Memory of Tropical Romance – now revitalized for a new era. Tiv’s unique designer fragrance has now been carefully updated by Cynthia, creating a new luxurious, contemporary perfume that is a sultry and sophisticated reinterpretation of the classic scent. To celebrate this classic yet new “essence of the Caribbean”, we’re inviting you to join the TIV VIP CLUB and enjoy an exclusive one-time offer of 30% off your first Tiv perfume purchase of any amount! Unlock your bonus gift by clicking below to become a TIV VIP CLUB member and we will email you your coupon for 30% OFF your next Tiv purchase. “TIV is the best fragrance that I have ever bought. I was first introduced to it when I asked a friend and member of my church what she was wearing, because it was such a pleasing fragrance. She ordered some for me and now it is the only fragrance that I wear. I always suggest for it as a gift whenever someone ask me for a gift idea for me!!. Please consider makingTIV lotion again. I love fragrant lotions and know that it will be as great as the other products. A Customer 4ever!! Always,” Joan T. – Washington D.C.